There's a certain inescapable irony within modern American metal. Positively, in the last ten years, there has been a noticeable renaissance of the art form in the States thanks to bands like Trivium, Avenged Sevenfold, Atreyu, and Lamb of God, among many others. Unfortunately, in the latter half of the same time, there has been a noticeable growth in redundancy resulting in monotony and mediocrity like that which consumed the hair/glam music of the late 1980's. How many times can you reinvent the modern metalcore wheel? It's slowly becoming a parody of itself. How soon will we have a Spinal Tap for this generation? You can see this trend in individual bands as well as within whole labels; Trustkill Records comes to mind. The pathology is particularly horrible within the Christian metal camp as band after band repeats the same metalcore with only the slightest of original nuances. There have been noteable progressions. Atreyu and Trivium, to name two, have abandoned some bits and pieces of the metalcore motif by pursuing less death vocals and more melody. Atreyu, and Avenged Sevenfold as another example, have done better at this than Trivium. Enter Lamb Of God and their new work Wrath. Within this disc, you will find some subtle changes like more melodic arrangements of heavy thrash metal as on 'The Passing' or the outstanding, and only remarkable piece on the work, 'Broken Hands.' 'Dead Seeds' is similar to the latter, but hardly as compelling. What is compelling on these three pieces is the expert guitar solos. In those moments, LOG actually begins to sound like a true metal band. There even appears to be movement towards progressive metal, on the extreme end, on the interesting 'Everything To Nothing,' but this is short lived. 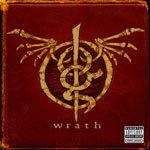 Generally, however, Wrath merely delivers more of the same ordinary modern American metal. There's lots of very heavy, intense and harsh thrashing around for the youngsters in the mosh pit. But mostly Wrath is Randy Blythe belligerently, yet cleanly, screaming his fool head off. Frankly, this time his vocals are more annoying then ever before; so much so I can't believe I actually picked out the bright spots on this album. His vocals are so harsh, so relentless, I would recommend the US military use this album to scare the next unwanted facist dictator out of his compound. With this said, if Lamb Of God can continue their pursuit of the more melodic and progressive sides of their chosen path, I can see them not only evolving into something brilliant but also significantly impacting the whole course of American metal. However, I have my doubts about this. Lamb Of God seems to be progressing from the ubiquitious metalcore motif that marks and hinders 90% of modern American metal, if ever so slightly. There ares some truly bright moments on Wrath that actually invoke melody and venture towards (extreme) progressive metal. And you might actually find them, if you can get past Randy Blythe's horrible and relentless screaming.